The Cincinnati Reds (4-17) will look to start their first win streak of 2018 tonight at 6:40 PM against the Atlanta Braves (12-9). The Reds offense exploded for 10 runs last night to end their five game losing streak. The Reds had gone 50 consecutive innings without taking the lead prior to last evening. Monday’s seem to be the best day of the week for the Reds. They are 3-1 on Monday’s, but 1-16 on every other day. The Reds scored 10 runs last Monday also, but were then shutout each of the next two games in Milwaukee. Tyler Mahle‘s numbers might not look like much, but has been above average in strikeouts and walks. It has been the home run ball that has been Mahle’s undoing so far in 2018. Tonight will be Mahle’s first time ever facing anyone in the Braves lineup. Brandon McCarthyÃ‚Â is a 13-year veteran starter. When McCarthy has been healthy, he has had a nice career. He does however have a 8.78 ERA in 13.1 career innings against the Reds, but they haven’t faced him since 2014. The big news of the day is that Eugenio Suarez will be starting a rehab assignment at AAA-Louisville tonight. He suffered a broken thumb just 16 days (!) ago. He can’t return to the Reds lineup soon enough, although I am sure the Reds will ease him along in the rehab process (and rightfully so). How about a winning streak? That would be quite the accomplishment, right Nation? Go Reds! It’s because Duvall was an “All-Star” once. What a joke. Eugenio Suarez may be the most important player for the Cincinnati Reds considering his defense. The record without him supports that. Things are looking better. USA Today Sports has the Reds, Marlins and White Sox with 0.0 chance to reach the playoffs, so the key for the remaining five months of the 2018 season is development for 2019. I hope veteranariness will stay in the background. Let them young guys play. Did anyone notice that the last five hitters in Reds lineup are hitting under .200? I wonder if Jim Riggleman knows that? Someone should wake him up and tell him. Yes, pretty sad. Why isn’t Scheb playing CF and Winker in RF and Billy catching splinters? Inquiring minds want to know. Because we are in last place and not scoring runs. Take a chance, people. Let’s see..Because he’s coming off an injury, isn’t a good centerfielder and has a career obp of .316? What’s the,chance anyone picks him up? Zero sounds about right. HeÃ¢â‚¬â„¢s play like five games in a row, has he not? Gotta give them (a small amount of) credit for cutting him and Gallardo pretty quickly. Now IÃ¢â‚¬â„¢m confused, Quackenford and Shacklebush? I have read this piece twice and still cannot make up my mind if Castellini is in denial, having problems with senility or is a flat-out liar. I do come away from reading it feeling that there is something deeply wrong with how the Reds are run and how decisions are reached. Especially when compared to how successful MLB teams are run, with a clear and decisive General Manager in charge of the roster. What do you expect the majority owner to do? Say his players and organization are crap? This is what a CEO does; try to instill confidence and protect his employees. Much of what he said is true, but there are a lot of unanswered questions. I don’t think he’s a liar, but I think there are other things that are unsaid. Such as: The Reds have had four straight losing seasons, and this one doesn’t look any better. When will it really get better, and why do you think so? Are we ever going to hire any quality free agents? Are you happy, specifically, with the return on trading Aroldis Chapman from the Yankees? Essentially, we got nothing of value for him. So what kind of double talk is this??? He basically said he doesn’t meddle, then he said this is what we should do. Wow, heads up umpiring there. Reds should just keep hitting the ball 40 feet. For once the bad breaks are happening to the other team. My thoughts exactly.We need to small ball them to death or slow ball them may be a better way to put it. Hatcher getting bailed out here. Shouldn’t have held Scooter at third with one out and a pitcher/Hamilton up next. Glad it worked out, but it shouldn’t have. Votto hit it too far. Great start for Tyler Mahle. Winker drives in Blandino. Positives for the rebuild. once through the lineup and Mahle has 6 K’s. Have they given away pizza this year? LaRossa’s certainly has to be overstocked by now. Two more days for the Redleg Nation fundraiser. If you donate during this Reds game you’ll get a shout out in the game thread. Suarez 0 for 1 with a walk so far for Louisville. Freeman has a big upper cut swing. Pitch him at the top of the zone. Right on cue, Mahle gets him on a comebacker. Does Mahle know what he is doing? It appears so. And he is actually pitching with the Reds giving him the lead. Which is pretty exceptional this year. So give the young guy some props. David Johnson just contributed to Redleg Nation. Thanks, David! 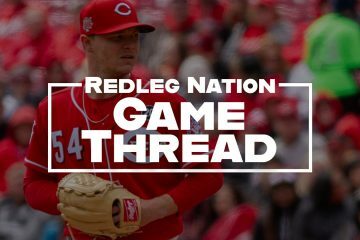 You’ll want to have donated to Redleg Nation on the night Tyler Mahle throws a no-hitter, right? Wow. Mahle just dealing. Impressive. Mahle has something going on through 5 innings. Also has 8 strikeouts (and 2 walks). The drought is over. VOTTO!!!!! Scooter gets his first… Back to back! That’s 11 of them through 6. Wow, Mahle hitting the upper 90’s. I didn’t know he could throw this hard consistently, thought he was more of a mid-90’s guy with more control (thus the few walks). Hardest I’ve seen him throw. He’s in the zone. This is easily the most fun IÃ¢â‚¬â„¢ve had watching a game this year. I compare him more to Mike Mussina. Also good comparison. I saw Maddux pitch a lot in the 90s when I lived in Atlanta. Both Mussina had that bulldog mentality. Of course that mentality is getting Mahle in trouble now. That must have been special to see those Braves teams of the 90’s play in person. Maddux/Glavine/Smoltz were masters at their craft. Yep, I moved there in the fall of 1990. Bought a 20 game package the following spring because I love baseball and didn’t care if the Braves were good or not. Of course I was still a die hard Reds fan. But got to attend World Series games in 91, 92, 95, and 96. The initial costs of my seats in 91 were $8. 20 rows behind 3rd base dugout. Suarez: 1-2, double, 2 BB’s. Riggleman replaced the clubhouse calendar with a new version that had all Mondays. Suarez 1 for 2 with 2 walks in Louisville. I believe blandino is 6 for his last 14. He was 1 for his first 14. Something like that. Playing time helps. He was playing almost every day when he was .059 (1-for-17). True. Maybe I should say extended time. Getting used to playing at this level. I like the look of mlb.comÃ¢â‚¬â„¢a homepage right now. Well… that didnÃ¢â‚¬â„¢t last long. There goes the no-no and the shutout. Still, fantastic job, young man. That one threatened to take down a satellite or two. Think he’s running out of gas. Very impressive start. Ok, Mahle has hit the wall. Get him out of there. HR/double…next guy that reaches should be about it. 6 great innings then … Great start. I think he just found out that mlb hitters adjust. Gotta change things up and keep them on their toes. 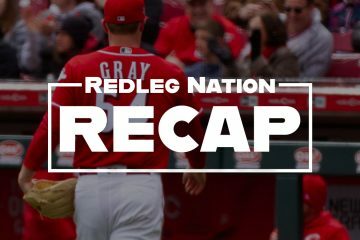 Stephen Nesbitt just donated to Redleg Nation to commemorate Tyler Mahle’s thrilling performance tonight. Thanks, Stephen! That’s as good of a reason as I can think of so far this season. I also noticed that RLN nearly missed last night’s recap of a rare win so I thought we might be in danger of folding here. /jk Keep up the great work guys and gals! For Winker to get a double, it had to be hit hard. Riggleman? Mahle had a clear adrenaline dump after K’ing the side in the 6th. Come on? A young guy doesn’t have to be at 100 pitches to take him out? I said to myself to pull him after the leadoff HR. Take him out on a high….not giving up a crooked number inning again? Stupidity and thats not 2nd guessing when you look at how Mahle has performed so far. Idiotic? Thats not it at all. The kid just dominated and its stupid to not be ready to pull him if he suddenly loses it….because his recent track record suggests that he suddenly loses it. Duh? I like Mahle alot and I’m glad they’re finally scoring some runs! The squeeze was nice too! I thought the same thing, but there’s something to be said for letting him work a little after the first hiccup in the game. It’s something he’ll need going forward. The lineup has hit well all night, you are up by two, and they call a bunt. The legend of Scooter grows. Nobody is high fiving Scooter in the dugout except the CPD cop. Reds need Ron Washington to change things up! Just realized that Frazier and Bruce were batting back-to-back for the Mets tonight. Frazier just walked and Bruce tripled him in. Coaches and managers or pay no attention to the game. I had no idea what they were talking about. Obviously they were just trying to make it so casual but there was nothing special going on. Part of the psych. Great squeeze and the the double steal. Love it. That was a sweet play by Peraza. Reds now getting combo of best young starters and relievers. Seemed like his command went away quickly. Leave Garrett in for the 3 inning save? Why not? We need to stretch him out for the rotation anyway, right? Have to get Garrett in the rotation soon though? Already failed to get starter innings out of Chapman and Iggy. They can’t let another live arm pitch 60 ip when they need 175 out of him? This feels like the kind of game we will end up losing. You know, the one where we should have won. Dude CAN NOT field his position well. At all. He had a better chance with a fork than the glove. WOW, just Ã°Å¸ËœÂ®. Snatching defeat (or a tie) from the jaws of victory. Scooter? He was never good defensively, but he was never half this bad last year either? Just smother the ball. If he keeps the ball in front of him then Votto’s plays wins the game. Pick him up now!! As much as I love Gennett , I have no problem waving goodbye when Senzel comes up. Adam Wolf just donated to Redleg Nation in honor of the Reds impending walk-off win tonight. Thanks, Adam! What is there to say? A great game by Mahle and now a tied game. 6 LOB. Never, ever when it counts. First Tucker drops a strike 3 foul tip , then the wheels fall off. A homer, a single then a double , then Iggy walks a batter to load the bases and then walks in a run , then Scooter what looks like an error muffs one hit directly to him. That should had been an error and should not have been charged to Garrett. Didn’t realize they did. Wow. It feels like Markakis is qualifying as a junior member of the Reds Killer club. He still has a long way to go to reach Freddie Freeman status, however. This bullpen issue seems vaguely familiar….. Besides Mes, who’s still on the bench? An extra-innings donation from Anita Culver for a walk-off win in the 11th. Thanks, Anita! Whenever Billy goes 1 for 5, his average climbs. That’s where we are at when he is at the plate. Billy leading off the inning against a pitcher who has control problems, and he swings at a 2-1 pitch nearly in the dirt. These guys don’t deserve to win. Somebody shut Thom up about starting innings off with runners on 1st/2nd. Go Crazy Folks!!!! GO CRAZY!!!! !